Hays bald eagle news flash! Last night around 9:34pm the Hays bald eagle nest tree fell during a terrific wind storm. The female bald eagle was on the nest at the time, incubating the egg she laid last Friday evening, February 10. Archived video shows she flew away before the tree fell. Reports from the trail, awaiting confirmation, say that both eagles were seen flying so they are fine. We are waiting for dawn to find out more. ASWP will visit the site and provide news updates at the pittsburgheagles Facebook page here: Bald Eagles in Western Pennsylvania – Audubon Society of Western PA.
My thoughts about the timing of this incident: It is good news that this happened very early in the nesting season. There were no chicks in the nest and it is so early that there is still time for the adults to re-nest nearby. 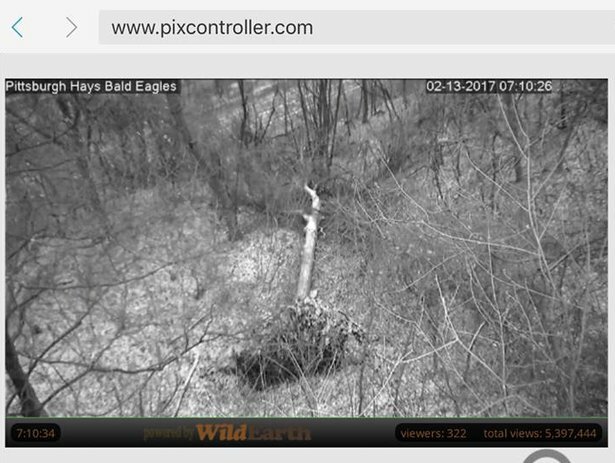 [Hays, PA, February 12, 2017, approx 10:00pm] – It appears that the tree that is home to the Hays Bald Eagle nest has been damaged in tonight’s wind storm. 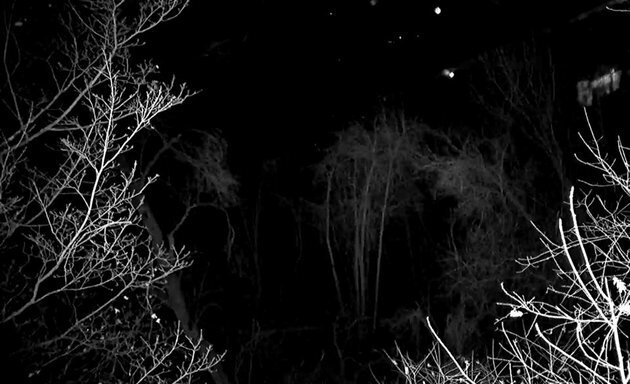 From our Bald Eagle camera view, at www.aswp.org, the tree is no longer visible. “The tree was impacted by tonight’s storm and we will need to wait until daylight to get onsite and determine what has happened,” says Jim Bonner, executive director, Audubon Society of Western Pennsylvania. The status of the nest and the eagles cannot be verified until daylight, when Audubon can safely visit the site. We will continue to keep the media updated on the status of the nest and the Bald Eagles. Please see below a screen shot of the current view from the camera. The tree and the nest are not visible. Update: Just reviewed the archives, the tree fell at 9:34 pm. Looks like the female was on the nest. She was awake at the time and flew off of the nest as the tree fell out of view. These are admittedly not the world’s best screen grabs, but you can see the eagle awake just as the tree starts to go, then getting off of the nest as the tree goes down. The tree fell over at the root ball. My comment on this: The ground was extremely soggy after 4″ of snow melted all at once on Saturday. It’s very common for trees to fall like this when the ground is soggy. Many people are visiting the Hays Eagle Viewing Site to check out the eagles’ status. About 8 people were in the vicinity when I arrived at 4:00pm. I’m happy to report that the eagle pair is doing well and easily seen flying, perching, hunting and mating. The male brought sticks in his talons a couple of times while I was there so they are already thinking about a nest. If I was to lay bets … I bet that a month from now they’ll have a new nest in the vicinity of the old one and she’ll lay eggs again. I’d also bet (based on the lack of big trees within nestcam view) that we won’t be able to see it on camera. Hopefully they’ll pick a site we can see easily from the trail. Oh no! What happens now? It’s too late for them to build a new nest, isn’t it? Kristin, we will wait and see. I have followed this nest since 2014 and have totally fallen in love with Mom & Dad Hays. It is a devastating loss to lose this nest but these 2 eagles have suffered tragedies before and continue to stay strong. They have been seen and heard by reputable sources so we know they are safe. It’s up to them to decide what to do next but it is my hope they remain in the area, build a new nest, and continue on with the Hays Eagles legacy. HAYS STRONG will live on! What happens if mom has to lay another egg??? Patti, she will lay it wherever she can. Without a nest she won’t be able to incubate it … so it will not be viable. Thanks Kate. So very sad. It was something to look forward to watch as a diversion from all this horrible political crap that is plaguing this nation now. Hoping maybe they can find an unused nest somewhere. When do you think the Pitt falcons Will lay first egg? Patti, the peregrines lay their eggs in mid to late March. Oh no. That is devastating news. I hope its not to late for mom and dad to relocate. So sad for the egg. Kate, thanks for your response and the links. That makes me feel a little better. I’ve totally fallen in love with this pair and their brood. I hope they stay nearby. Maybe we’ll get lucky and they already have another nest to go to! Thank you for the information Kate. Yes we do see trees topple, wet ground, high winds, plus this tree had to be pretty top heavy, those nests are heavy. Thankful Mom and Dad are ok.
I’ll be watching Pitt’s nest closely this year. Last year I couldn’t keep up with all the changes. I have never really liked bird’s until I happened to run across Dorothy and her last chick. I followed all cams/nests faithfully. It has gotten me through three really bad personal years. Sometimes the bird’s were suffering as many losses as myself. I have watched wonderful things going on camera as well as pathetictic things. Is what we witness on camera par for the course in nature or is Pittsburgh just taking more than it’s share of problems recently? Karen, yes, this is par for the course. KDKA has a story online by Amy Wadas who also did the on-air piece @ noon today. Unfortunately Dana Nesiti’s name was misspelled in both. Rode past at 3:30 this afternoon. I saw a red tailed hawk on the electrical lines. I think there is a nest nearby. Maybe the eagles will take over an existing nest. Very weepy eyed for our Eagle family. It is just devastating. So many people from all over the world have enjoyed our Eagle pair. Watched mom lay one of her eggs last year. Hope they build a new nest nearby. Glad they are both ok! I’m glad it was early in the season and not when the egg had hatched. Thank you for the update Kate! Glad to hear that their new nest will be visible from the trail. Audubon Society has confirmed that the Hays eagles are incubating an egg on the new nest. Remarkably, the eagles built their nest in less than a week after the old one fell.